The CNZ Audio Chromatic Tuner Pedal has a solid metal body and the LED Lights are a stunning colored indicator of your tuning. The large, multi-color LED Display will brighten up any pedal board. The shiny silver is complimented by a dynamic blue dotted graphic pattern. While it has a solid build, its mini size also allows it to be lightweight, easy to travel with, and leaves plenty of room on your pedalboard. The durability of the body and display screen will keep this operating year after year while lugging around from gig to gig. The bottom of the pedal has a thick rubber pad to keep it still on any surface. The dynamic LED Display on the Tuner Pedal provides color coordinated tuning information that is fail safe to making sure you are in tune. It's great accuracy and attractive packaging makes it a must on any pedalboard. Inspire Your Music with CNZ Audio! 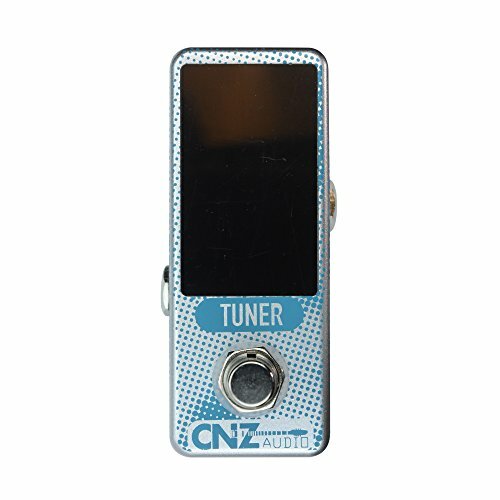 The CNZ Audio Chromatic Tuner Pedal has a large, brilliant LED Screen to indicate and easily read the tuning of your guitar. The silver color with dynamic blue dot graphics on the pedal, the colorful LEDs and the mini size with the large display make this a must for any pedalboard! It provides great accuracy with several sets of Red LEDs on the left when your string is flat and a large series of Red LED lines on the right when the note is sharp. A line of Blue of LEDs comes up in the middle when the guitar is in tune. A large letter displays the note that the string is closest to including a # when the note is sharp. There will not be any mistake as to which note your string is on! Turning on the pedal on will mute the guitar and allow you to tune. Turning the pedal off will unmute the guitar and change it to True Bypass Mode and provide transparent tones for your guitar playing. Inspire Your Music!